Over the past week, high-profile contributors to the campaign of Senator Cindy Hyde-Smith including Walmart, AT&T, Pfizer, and Major League Baseball have requested a refund after the Mississippi politician’s “public hanging” remark sparked outrage. Google, which distanced itself from the candidate following her remarks, has not publicly requested that its $US5,000 donation to the senator be returned, according to Popular Information reporter Judd Legum. Google has quietly joined other high-profile companies in requesting its campaign contributions to Senator Cindy Hyde-Smith be returned after the Mississippi politician’s “public hanging” remark drew widespread criticism, according to Popular Information reporter Judd Legum. The California-based search giant donated $US5,000 to the Hyde-Smith campaign on November 2, before the controversial remarks were made. Google’s donation to Hyde-Smith was first reported by Popular Information – an email newsletter publication – two weeks ago. In a statement to Popular Information at the time, Google distanced itself from the candidate but made no indication that it would request the funds be returned. “This contribution was made on November 2nd before Senator Hyde-Smith’s remarks became public on November 11th. While we support candidates who promote pro-growth policies for business and technology, we do not condone these remarks and would not have made such a contribution had we known about them,” Google said in the statement. Senator Cindy Hyde-Smith will face off against Democratic challenger Mike Espy on Tuesday in a special election for one of Mississippi’s Senate seats. 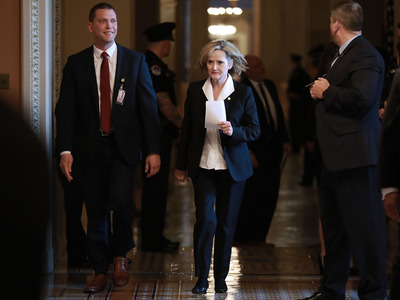 Hyde-Smith was appointed to the position earlier this year after Senator Thad Cochran stepped down due to health issues.